Would you like to add a watermark to your gallery images? With Envira’s Watermarking Addon you can easily achieve this. We’ll walk you through how to create a gallery of images with a watermark using the Envira Watermarking Addon. Can I remove or change the watermark image? Does the watermark get added to all gallery images? Why is there a delay in showing the watermark image? Can I use GIF files in my gallery and add the watermark? I’m not seeing a Watermarking tab on the Dynamic settings or on Envira Albums? The lightbox thumbnails aren’t showing the watermark? The gallery images aren’t showing the watermark but the lightbox images are? Ultimate, Agency, Pro or Plus Envira license. You can read how to upgrade to one of these licenses here. In this instance, you’ll be activating the Envira Watermarking Addon. Navigate to the Watermarking tab. Click the Enable Watermarking? box to enable watermarking. Next, select your watermark image from the Media Library or upload a new image. Then you can choose the Position and the Margin for your watermark placement. Finally, click Publish or Update on your gallery to save the changes. That’s it! You have created your watermarked gallery. If you want to add additional protection by disabling right click on your images, check our Protection Addon. Q: Can I remove or change the watermark image? A: No, the watermark is applied to the original image so it can’t be removed. You’ll need to re-upload the original image to your gallery. Q: Does the watermark get added to all gallery images? A: Yes. Your images will appear with a watermark when viewed in the thumbnail layout, in lightbox view, and even the thumbnails if you enable thumbnails to appear in lightbox view. Q: Why is there a delay in showing the watermark image? A: The server your website is hosted on will process the images in the background to add a watermark. 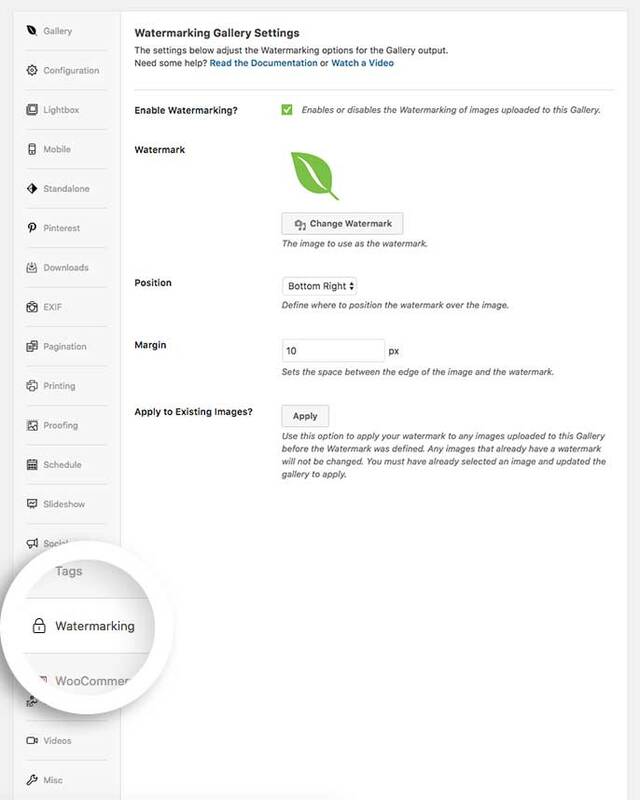 If the images you’re watermarking are very large, there are many images in your gallery, or your server is running slow for any reason, you may notice a lag between when you configure watermarking for a gallery and when the images are done being processed by your server. If you’re noticing very large lag times, you may wish to contact your web host about how to improve the performance of your server. Q: Can I use GIF files in my gallery and add the watermark? A: We recommend a .png file with a transparent background. Q: I’m not seeing a Watermarking tab on the Dynamic settings or on Envira Albums? A: Watermarking is not available for dynamic galleries or for Enivra albums. Q: The lightbox thumbnails aren’t showing the watermark? A: If you did not set up the watermarking functionality before uploading your images to the gallery, you will need to change the Image Dimensions in order to force the regeneration of the images. This causes a new image creation using the watermark. Q: The gallery images aren’t showing the watermark but the lightbox images are? A: This could be because you’re cropping the images in the center so where the watermark is placed, you may not see it in the gallery view if you’re using cropped images. Fix: "Black box" should no longer appear when a watermark image that is taller than the gallery image. Added: Option to apply watermark to existing gallery images.